Generic operation result class Has warning/error list, boolean status and arbitrary value. "Good" means the operation was completed with no warnings or errors. "OK" means the operation was partially or wholly completed. An operation which is not OK should have errors so that the user can be informed as to what went wrong. Calling the fatal() function sets an error message and simultaneously switches off the OK flag. 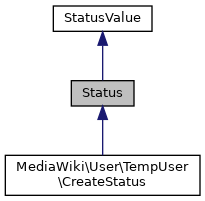 The recommended pattern for Status objects is to return a Status object unconditionally, i.e. both on success and on failure – so that the developer of the calling code is reminded that the function can fail, and so that a lack of error-handling will be explicit. Definition at line 40 of file Status.php. Definition at line 78 of file Status.php. References $name, StatusValue\getErrors(), and StatusValue\isOK(). Definition at line 97 of file Status.php. References $name, StatusValue\$value, and StatusValue\setOK(). Don't save the callback when serializing, because Closures can't be serialized and we're going to clear it in __wakeup anyway. Definition at line 391 of file Status.php. Definition at line 399 of file Status.php. Definition at line 140 of file Status.php. The code string can be used a message key with per-language versions. If $error is an array, the "params" field is a list of parameters for the message. Definition at line 283 of file Status.php. References $lang, cleanParams(), languageFromParam(), and wfMessage(). Referenced by getErrorMessageArray(), getMessage(), and getWikiText(). Definition at line 328 of file Status.php. References $e, StatusValue\$errors, $lang, getErrorMessage(), languageFromParam(), and use. Referenced by getMessage(), and getWikiText(). array A list in which each entry is an array with a message key as its first element. The remaining array elements are the message parameters. Definition at line 342 of file Status.php. Referenced by CliInstaller\showStatusMessage(), and WebInstaller\showStatusMessage(). Definition at line 313 of file Status.php. References $lang, $out, getWikiText(), languageFromParam(), null, and MessageCache\singleton(). $shortContext and $longContext can be used to wrap the error list in some text. $shortContext will be preferred when there is a single error; $longContext will be preferred when there are multiple ones. In either case, $1 will be replaced with the list of errors. $shortContext is assumed to use $1 as an inline parameter: if there is a single item, it will not be made into a list; if there are multiple items, newlines will be inserted around the list. $longContext is assumed to use $1 as a standalone parameter; it will always receive a list. If both parameters are missing, and there is only one error, no bullet will be added. string|string|bool $shortContext A message name or an array of message names. string|string|bool $longContext A message name or an array of message names. Definition at line 231 of file Status.php. References $lang, $s, StatusValue\fatal(), getErrorMessage(), getErrorMessageArray(), StatusValue\getErrors(), StatusValue\isOK(), languageFromParam(), and wfMessage(). Referenced by LocalFileLockError\__construct(), BotPassword\loginHook(), MediaWiki\Auth\AbstractPasswordPrimaryAuthenticationProvider\setPasswordResetFlag(), and StatusTest\testGetMessage(). Definition at line 365 of file Status.php. References $type, as, and StatusValue\getErrors(). Referenced by getErrorsArray(), and getWarningsArray(). Definition at line 132 of file Status.php. Definition at line 353 of file Status.php. Definition at line 175 of file Status.php. References StatusValue\$errors, $lang, $s, as, StatusValue\fatal(), getErrorMessage(), getErrorMessageArray(), StatusValue\getErrors(), StatusValue\isOK(), languageFromParam(), and wfMessage(). Referenced by EditPage\formatStatusErrors(), getHTML(), EditPage\handleStatus(), and StatusTest\testGetWikiText(). string | Language | null | StubUserLang $lang Language to use for processing messages, or null to default to the user language. Definition at line 156 of file Status.php. References $lang, Language\factory(), RequestContext\getMain(), and null. Referenced by getErrorMessage(), getErrorMessageArray(), getHTML(), getMessage(), and getWikiText(). Splits this Status object into two new Status objects, one which contains only the error messages, and one that contains the warnings, only. Definition at line 119 of file Status.php. Definition at line 55 of file Status.php. Referenced by LocalFile\acquireFileLock(), MediaWiki\Auth\AuthManager\allowsAuthenticationDataChange(), MediaWiki\Auth\AuthManager\autoCreateUser(), MediaWiki\Auth\AuthManager\beginAccountCreation(), MediaWiki\Auth\AuthManager\beginAccountLink(), MediaWiki\Auth\AuthManager\beginAuthentication(), MediaWiki\Auth\AuthManager\canCreateAccount(), SpecialPasswordReset\checkExecutePermissions(), MediaWiki\Auth\AuthManager\continueAccountCreation(), MediaWiki\Auth\AuthManager\continueAuthentication(), AuthManagerSpecialPage\displayForm(), CurlHttpRequest\execute(), ApiResetPassword\execute(), PhpHttpRequest\execute(), GuzzleHttpRequest\execute(), MultiHttpClientTest\getHttpRequest(), ApiUsageException\getMessageObject(), ThumbnailRenderJob\hitThumbUrl(), SpecialPasswordReset\onSubmit(), MediaWiki\Auth\AuthManagerTest\provideAllowsAuthenticationDataChange(), MediaWiki\Auth\TemporaryPasswordPrimaryAuthenticationProviderTest\provideProviderAllowsAuthenticationDataChange(), MediaWiki\Auth\LocalPasswordPrimaryAuthenticationProviderTest\provideProviderAllowsAuthenticationDataChange(), LocalFile\releaseFileLock(), Http\request(), LoginSignupSpecialPage\showSuccessPage(), and AuthManagerSpecialPage\trySubmit(). Definition at line 42 of file Status.php.